The Setting – Saturday night, washed roads and you’re raring for a ride and to hang out with the usual crew at the local pub. Cuffed jeans and tanned boots define your riding style. Welcome to the 50s, this is where it all began. Men have raced for a very long time but things really picked up during this era when one looked forward to hanging out over the weekends, talking motorcycles and having other meaningless conversations while knocking back a few with the know and unknown. All conversations ended with where to move the party to next which gave rise to short burst races from one café to the next. Back then, ideally you would have owned a powerful 500 single or 650 twin. Stock out of the factory it came as a regular motorcycle but to make it faster you reduced weight by stripping down the heavier parts, throwing on a clip on or Ace handle bar made famous by the Ace café racing. If by now you haven’t guessed the manufacturer let me not hold back the suspense any longer. I have been fortunate in this day and age to my hands on a Triumph Thurxton 900, a motorcycle that took its queues and was born out of the café racing culture back in the 50s and first introduced back in 2004. 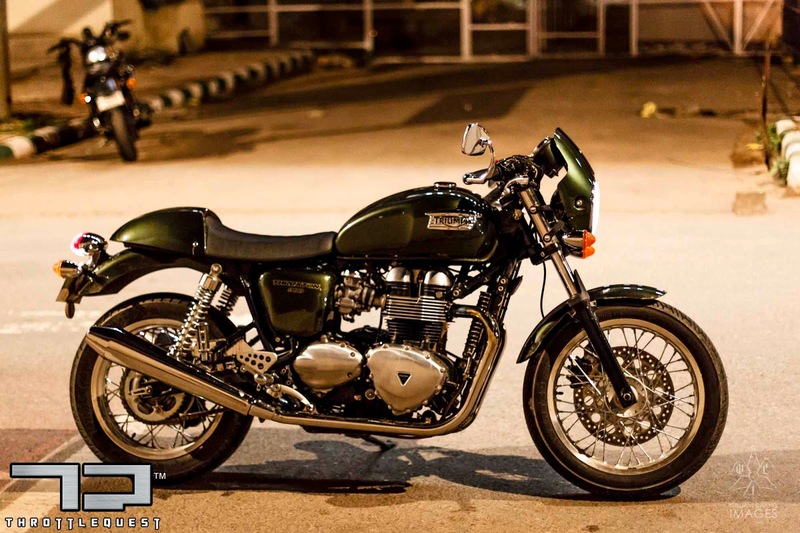 In my growing years I would witness every now and then a real classic in the form of a Triumph T120, the motorcycle that helped form the base for today’s Thruxton, a Norton Dominator or a BSA Golden Flash 650 twin. The sound from these carbureted beauties still gets my pulse racing to today. 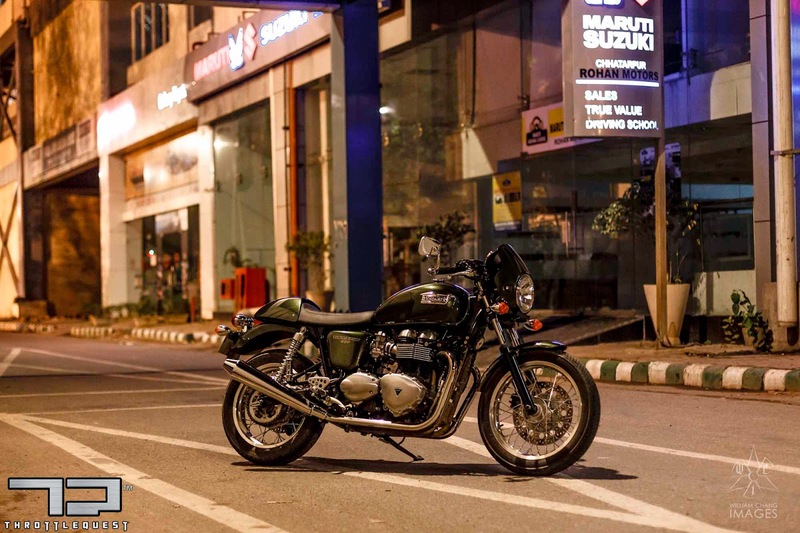 Fast forwarding to 2014 and Triumph is in India, giving us an opportunity to relive those “wonder years” without the classic motorcycle engine related niggles. 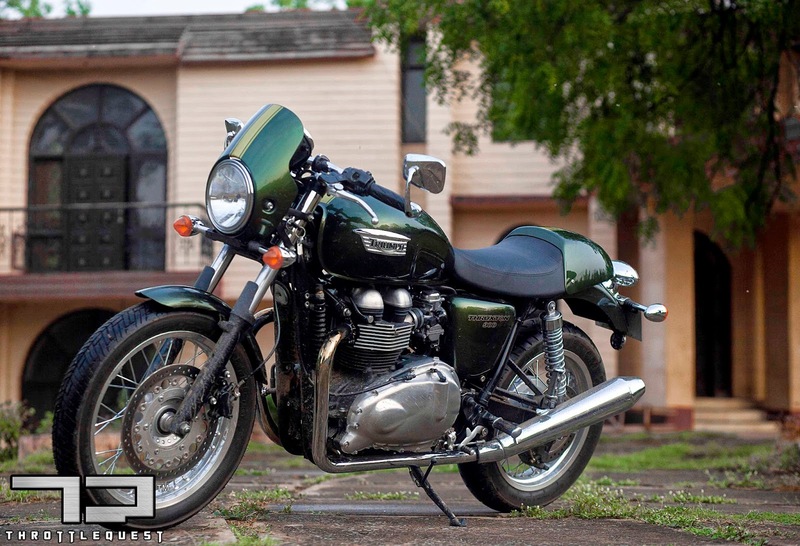 All of us have our favorite motorcycle posters that we grew up with but for me the name Thruxton has been a poster, an internet password and my sound of pain when getting a poke at the docs as far back as I can remember. I was due to pick up the bike and the term “braving the afternoon NCR heat” changed to “get out of my way, let me at it”. While picking a bike for review one is required to sign a few documents………errr here’s my soul, where are the keys? I think Triumph has nailed it. Café racers stand out and are recognized by the flat line that runs from the front to back, a hard to miss design element on this particular ride style. This straight line is the first thing that will catch your eyes if you’re the kind of person who gives his bike a second glance while walking away from it. Ideally a café racer comes with the same rim size sets but not on the Thruxton, this comes with an 18” front and 17” rear but we will come to that later. Lines drawn from the mid center of the wheels should act as end points and the entire mid section including the headlight and the ending of the cowl should fall between these lines. In the case of the Thruxton, it over extends a bit but they managed to keep the seat depth low which visually balances the entire setup. With the Ace handle bars you get rear sets positioned like a modern day sports bike. That’s it for now, if I gave away all the design secrets you’d probably end up building your own café racer. Why go through all that trouble, Triumph has done all the hard work for you. The Thruxton I rode came in Brookland Green with a matte finished gold racing stripe running through the centre of the tank and the seat cowl. All this has been styled around a Tubular steel cradle, Swingarm 2-sided tubular steel frame that provides exceptional balance even at low speeds. To begin with if you have never heard a classic parallel 650cc twin engine, leave this article alone and get out there searching for one or else holla at us and we will make sure you are not deprived of this. It is one of the best sounding engines especially when one pulls away from you through the gears. 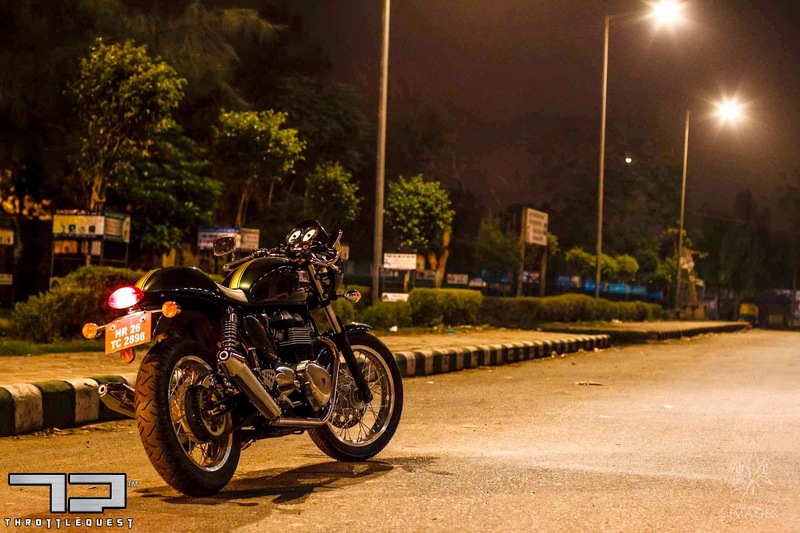 Triumph has increased the power on the Thruxton with a refined air cooled double overhead camshaft, 360 degree 865cc parallel twin churning out a healthy 69PS with 69Nm of torque. 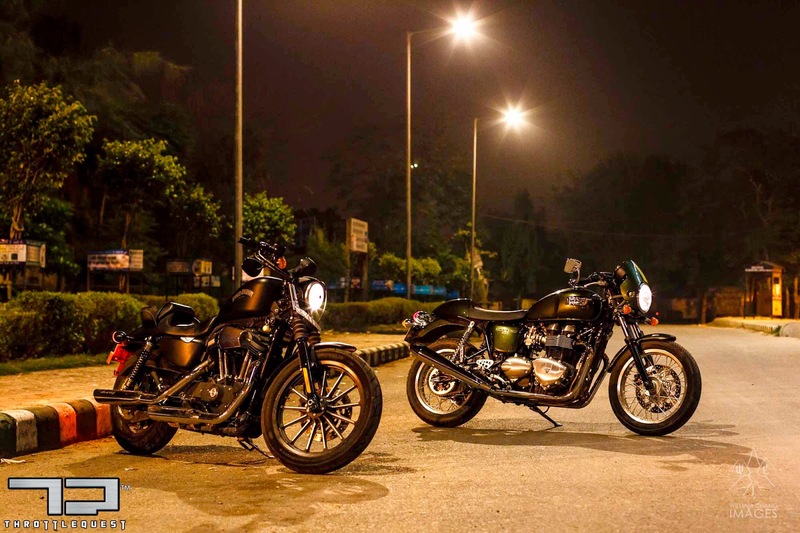 The Triumph Scrambler is the only other bike with the same engine firing at 270 degree interval. (Google for a sound comparison between the two and spot the difference). The engine is one of the most refined parallel twin engines that I have ridden and is very forgiving on the road especially if you’re moving from a modest 250cc commuter available in India today. The engine is perfectly mated to a 5 speed transmission and is fun to ride. Kick it into gear and the bike has no problem touching the 160 kmp/h mark and I am sure it could have done better but given the road I was riding on, I did not want to risk it considering the several 100 other bikes I wanted to help review. If you were someone who rode your bike purposely over sand found in patches over tarmac and whacked the throttle so that the rear end slid out while you shot forward, the Thuxton should be the next change for you. That said, the Thurxton is a little under powered for me but if you know me by now, I love getting to my triple digit figures and allow the world to take a look at me while I accelerate. One needs to return and pick up their bits and pieces along the way with the acceleration that some of the crotch rockets provide nowdays. 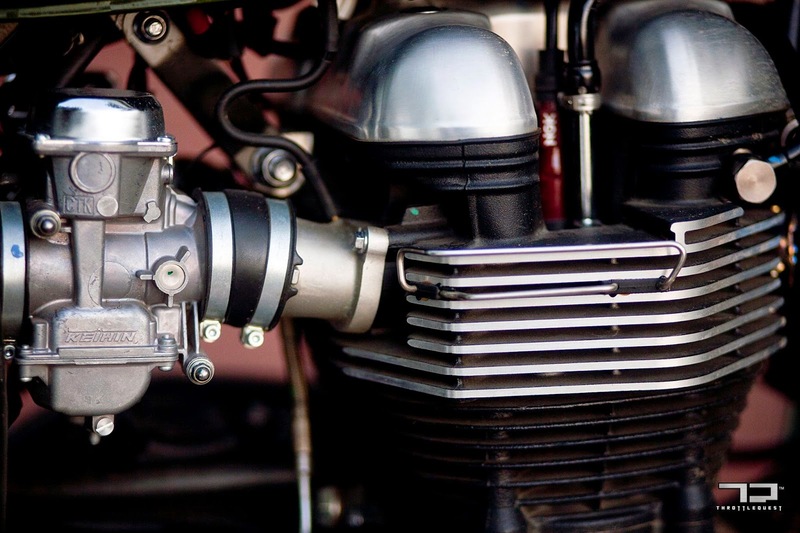 A major development on this bike has been the fuelling system; this is a huge step up from the carbureted engines and old world niggles that these bikes were famous for back in the days. Incorporated behind the fake carburetor holdings is a modern fuel injection system from Keihin and even though the bike comes with double overhead camshafts, for looks Triumph has placed a push rod at the front of the engine adding another design element from the bikes available in the 50s and 60s. My only disappointment has been the sound and I so hoped for a pair of Predator or Norman Hyde Toga exhausts on the Thruxton. The Thurxton comes with Front Kayaba 41 mm forks with adjustable preload and 120 mm travel and Rear Kayaba chromed spring twin shocks with adjustable preload of 106 mm travel. The ride is very comfortable and does not transfer any pot hole vibration to your back or hands. For me the handling was pretty good given that the front and rear came with 100/90-18” and 130/80 R17” Metzeler’s. The wheels are wire-spoked with aluminum alloy rims. At times especially at lower speeds I felt the bike to be a front heavy however one tends to forget this when on the move. At high speeds I found the bike very maneuverable and was able to zip through mid day traffic with ease. I am particularly fond of this riding and seating position but more so because of the culture and attitude one carries along with the bike. I was able to achieve fairly high lean angles at hold on, triple digit speeds! and I did not once feel scared doing so. You see in India you have to remain focused at all times. The road belongs to everyone and everything, humans, dogs, cats, cows and with the way people maintain their vehicles; mechanical bits and pieces along the road. Let’s just say you managed to dodge all of the above on a perfectly decent road, you’re then forced to take evasive action at the last minute and swerve because Mr. Naidu forgot to kiss his wife goodbye and decided to stop and reverse in the middle of the road. I don’t think Triumph considered all of the above while designing this bike but the point I am trying to make is that the Thruxton allows you to stay in control in these situations. Trust me, riding in Gurgaon is a like playing a video game and no points for hitting anything…its avoid, avoid, avoid! To assist, the bike comes with a front 320mm Nissin 2-piston floating caliper single disc and the rear with a 255mm Nissin 2-piston floating caliper disc. The feedback is good and provides the bike with enough bite to bring this 230kg (wet) bike to a stop. Triumph please take note, ABS may run the costs up but is a life saver and will be welcomed across the range of classics. No major additions here other than your normal ignition and parking switch located on the steering head. The left holds the indicator and light switch and the right the engine kill and starter. The round twin instrument console shows the basics including analog speedometer and tachometer with odometer, clock and trip information, low fuel lamp, neutral light, engine warning to name a few. I felt the rear illumination on the instrument panel can be improved on. One can hardly make out the numbers at night or in the day while riding. Yes I know this is a forbidden area to speak about when one thinks of purchasing a high end bike such as this but let’s face it, we are a price sensitive nation and for the majority of folks who read this article, this section matters. For the few hundred KMs I clocked in less than two days, the Thruxton gave me a decent 50 to 50 mpg which translates to roughly 5 liters of fuel to run a 100 KMs. Triumph has been adamant about providing great after sales service and have made sure their workshops were set up in line with the launch. On a lighter note, I am not sure if that’s a good or bad thing. Should we be expecting these to break down that frequently or the manufacturer was genuinely concerned. Triumph builds some great engines and I am confident they are committed to great after sales service. Their service intervals come in at 10000 KMs. 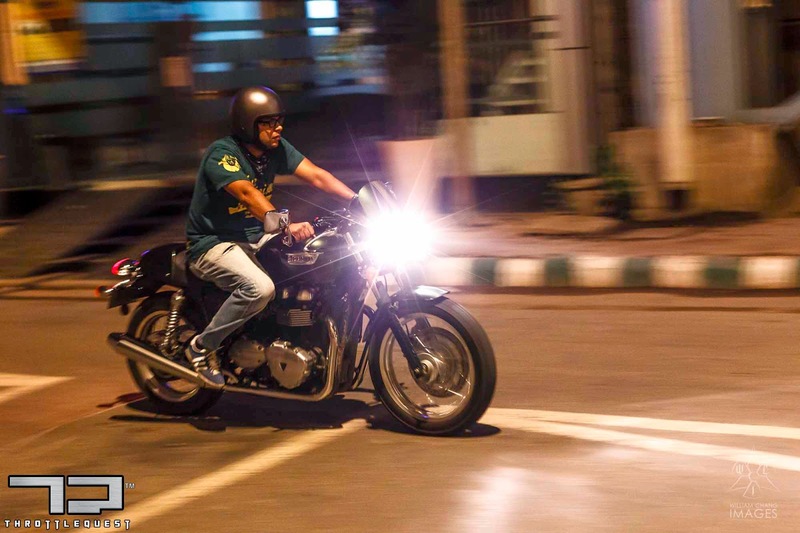 People there are motorcycles and then there are motorcycles like the Triumph Thuxton. There will always be finger pointing at electronics missing and that café racers are not meant for long distant riding. My take on this, buy into the culture, the experience, the attitude, the clothes, feel the road talking back to you, for once forget the protective gear and feel free. Hit the local pub and leave for another with your buds. I know I am going to face a fair amount of flack for my comments around protective gear but to put things into perspective this motorcycle from Triumph inspires confidence and will allow you to have fun on a good Sunday burn or on an outstation trip. If you can spare the 6.66L ex showroom price and park next to “them” crotch rockets at the local pub, I guarantee the attitude with which you will get off this bike will be the equivalent of an ol skool biker that likes to enjoy his rides and lives life one café at a time. 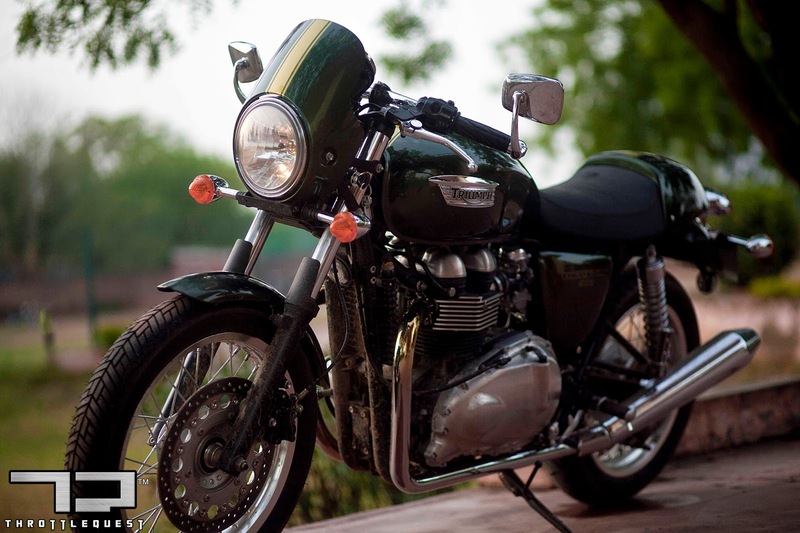 Take it from me; you will not regret owning a Triumph Thruxton 900. 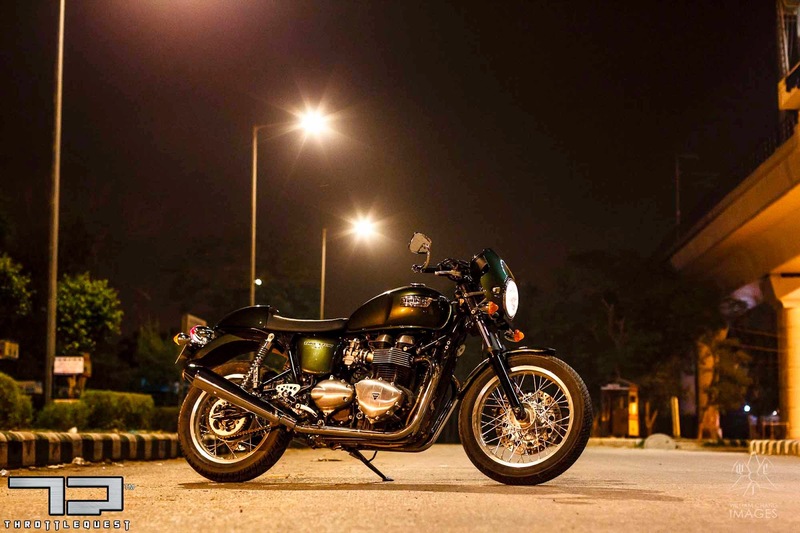 Last but not the least, we cannot thank Triumph India enough for giving us the Thruxton and partnering with us for this review. 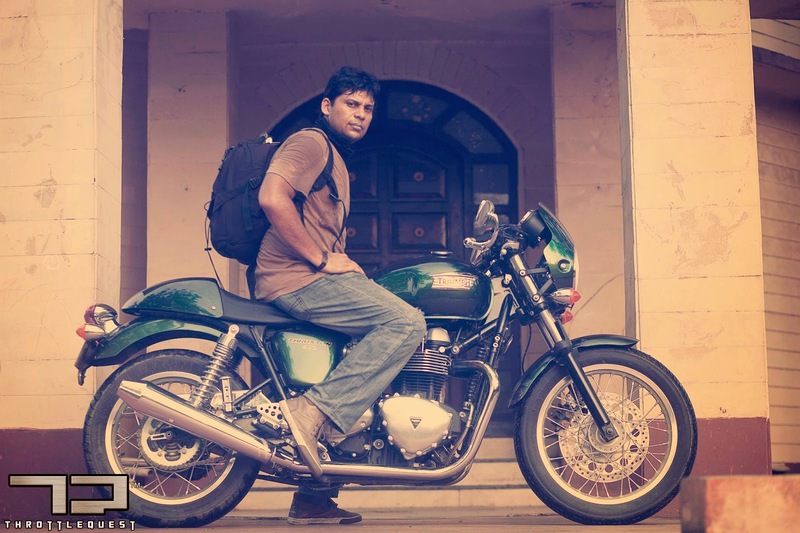 Thank a ton Triumph India.